1. 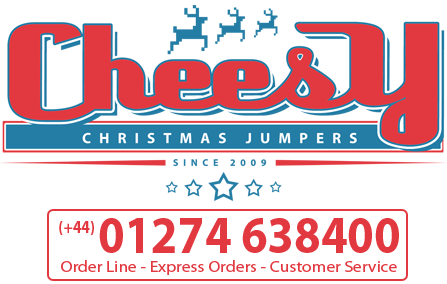 The promoter is: Cheesy Christmas Jumpers whose registered office is at 1 Stony Lane, Eccleshill, Bradford, BD2 2HL. 2. Employees of Cheesy Christmas Jumpers or their family members or anyone else connected in any way with the competition or helping to set up the competition shall not be permitted to enter the competition. 4. Route to entry for the competition is via Facebook. You will need to follow Cheesy Christmas Jumpers on Facebook so that we can inform the winner by message. 5. Closing date for entry will be 11:59pm (GMT) 1 January 2019. After this date the no further entries to the competition will be permitted. 7. The rules of the competition and the prize for each winner are as follows: Our 2019 Christmas Collection to be drawn at random. 11. Winners will be chosen at random from all entries received and verified by Promoter. 12. The winner will be notified by Facebook message within 2 days of the closing date. If the winner cannot be contacted or do not claim the prize within 3 days of notification, we reserve the right to withdraw the prize from the winner and pick a replacement winner. 13. The promoter will notify the winner when the prize will be delivered. 19. This promotion is in no way sponsored, endorsed or administered by, or associated with, Facebook, Twitter or any other Social Network. You are providing your information to Cheesy Christmas Jumpers and not to any other party.